Between the ages of ten and fourteen, I cut my reading teeth on the venerable Hardy Boys mystery stories, written by Franklin W. Dixon, the pen name used by a variety of different authors. 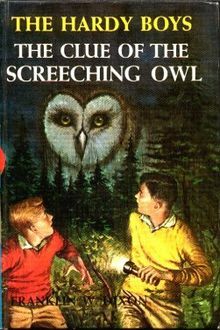 In my mind, I can still see the front cover of Book 41, The Clue of the Screeching Owl. What a look of fear on the faces of brothers Joe and Frank Hardy! The book blurb states: “When dogs and men suddenly disappear, and strange screams fill the night, fantastic stories of vengeful ghosts are almost believable.” Dramatic captions identified the terrifying illustrations, such as: “At that moment, two venomous snakes slithered out of the cave.” Heady stuff for a repressed teenager in the late 1960s and early 1970s. Because I was raised in a conservative home, where so-called “worldly” literature was frowned upon, I had to devise an undercover method of reading the Hardy Boys. Every day, I would take one Hardy Boys book home from the school library. After my homework was done, I would remain on the daybed in my father’s study, hide my “worldly” book behind a scribbler, binder, or textbook larger than the novel itself, and breathlessly devour it. I continued this practice until I had read all sixty-six books in the series, then turned to Nancy Drew, followed by Tom Swift. One night while reading, I listened with glee to a conversation between my parents. “Why do you say that, Aggie?” Hagar was Mom’s name, but she went by Aggie. I guess Dad hadn’t noticed. I often wonder about what Will Oxford calls “the mystery of the immortal detectives.” He says, “the primary ingredient in the Hardy recipe is adventure,” followed by “a healthy dose of mystery and intrigue.” The third ingredient is humour. The Hardy boys’ best friend, Chet Morton, can always be relied on for a hearty laugh, and Aunt Gertrude drops the occasional colourful remark. “Humour such as this gives readers a much-needed breather from the books’ breakneck pace.” Finally, the storyline follows a predictable pattern, including a brief reference at the end to the next title in the series. But none of this explains the books’ longevity. Will Oxford focuses on the boys who read the books. Will Oxford doesn’t know me, but he describes me to a tee. Recently, I picked up a Hardy Boys book for the first time in more than forty years. The ninth book in the series, The Great Airport Mystery, is described this way: “Valuable electronic parts containing platinum are being stolen from shipments made by Stanwide Mining Equipment Company’s cargo planes, and Frank and Joe Hardy are called upon to assist their world-renowned detective father solve the baffling case. As an adolescent, I was captivated by this description. But at fifty-eight, the same appeal simply is not there. There is a certain nostalgia, but I had difficulty remaining focused and I found it hard to finish reading the book. I’m no longer convinced the wonder I felt while reading the Hardy Boys as an adolescent can be recaptured as an adult. Of course, my reading has since taken me far beyond the Hardy Boys. I now read almost any- and everything between two covers. But those were the books that whetted my appetite for worldly literature.